Home > Used Vehicles > 2012 Honda Accord Sedan EX,SUNROOF,ALUMINUM WHEELS, AIR,TILT,CRUISE,PW,PL,LOCAL TRADE, VERY CLEAN, WINTER TIRES ON MAGS!!!! 2012 Honda Accord Sedan EX,SUNROOF,ALUMINUM WHEELS, AIR,TILT,CRUISE,PW,PL,LOCAL TRADE, VERY CLEAN, WINTER TIRES ON MAGS!!!! On Sale! Save $2025 on this one, we've marked it down from $15900. 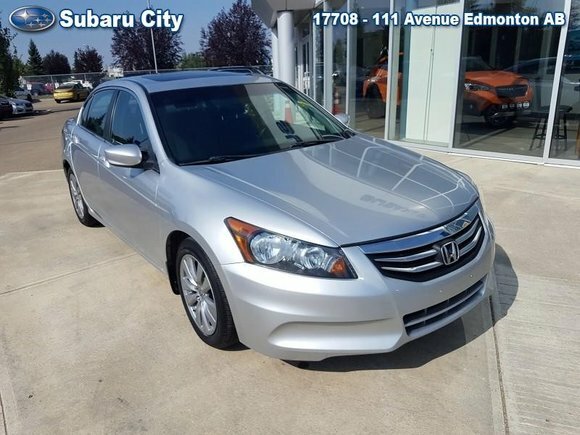 This 2012 Honda Accord Sedan is for sale today in Edmonton. Ample space for passengers and cargo make the 2012 Honda Accord Sedan a winning choice. Add in elegant styling and a refined cabin, and you have a sleek sedan you’ll enjoy driving. Efficient performance and advanced safety features come together to create a car that is ideal for daily commuting. This sedan has 102635 kms. It's alabaster silver metallic in colour. It has an automatic transmission and is powered by a 2.4L I4 16V MPFI DOHC engine. Buy this vehicle now for the lowest bi-weekly payment of $123.48 with $1540 down for 60 months @ 5.99% APR O.A.C. ( taxes included, $790 Administration and Secure Ride included / Total cost of borrowing $2195 ). See dealer for details. Want to try the 2012 Honda Accord Sedan EX?